Students from the School of Media walked away with three trophies at the Midland Media Student Awards, held in Birmingham earlier this week. The first award went to MA Data Journalism graduate Victoria Oliveres who won the Data Journalism category, for revealing that online disability hate crimes had tripled in three years. She used FIO details from 26 police forces to produce a well-researched and comprehensive piece that displayed a new angle to the on-going issue of hate crime – with social media companies in the spotlight for their failure to monitor and block unacceptable content. The second accolade went to Wan Ulfa Nur Zuhra, who was awarded the News category trophy. Judges noted that Wan’s work stood out for its powerful mixture of investigative and data journalism on topical public interest issues. They added that there was good analysis and strong human-interest angles and it was well-crafted in an accessible writing style. Lucy Ryan won the Broadcasting (Radio) category and the final award for the School for her epic series “The Lonely Death of Janet Parker,” detailing the world’s last recorded smallpox fatality, which occurred in Birmingham in 1978. The judges said it was thoroughly researched, well edited, with proportionate use of both first-hand accounts and expert analysis, and turned a tragic series of events turned into a compelling listen. Birmingham City University students Hafsa Naveed (Broadcasting, Television), Anisah Vasta & Abigail Nruah (Culture), Lydia Johnson (Culture) and Sania Aziz & Calum Archibald (Data Journalism), were all also highly commended for their work. 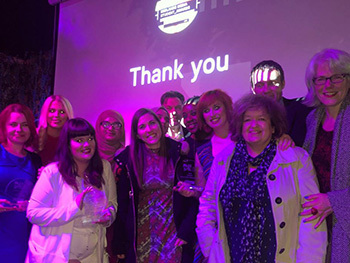 The awards were organised by Birmingham Press Club to acknowledge the achievements of next-generation journalists, broadcasters and photographers, and attracted several hundred entries from universities and colleges from the East and West Midlands. The event was held at Mama Roux’s in Digbeth and hosted by BBC Radio WM presenter Alex Noble. The standard of submitted work was truly outstanding – a real credit to the lecturers who are helping to craft their careers.